An alternative to the standard dunk tank game this game involves setting up a metal frame (easy assembly) and a person sits in a chair under a support arm that holds a water balloon in an open basket. 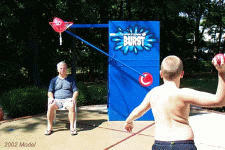 When someone throws a ball and hits the target the water balloon bursts and falls on the unlucky person sitting in the chair. So unique, it s been called "the 21st century dunking booth"